Mamary genetics galore! 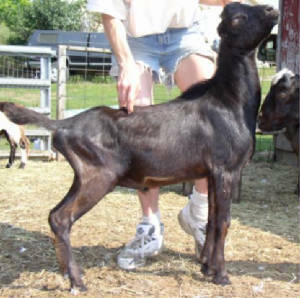 Camillo is a very handsome jet black, gopher eared & wattled young fellow who is long, level & dairy; has excellent leg set all the way around, is nice & angular & standing on good, strong feet. He is conformationally-correct & long-necked with a nice, typey head like his dam, who is one of our best show does. Camillo has an impressive escutcheon with a very high, wide & rounded arch, very pleasing shape & snug attachment of the scrotal area with good teat placement. His dam, Carmella's introduction to the sanctioned circuit in 2005 was a successful one, with her being named 1xGCH & 2xRGCH almost always standing behind only her own herdmates. We are very optimistic abt her future! Paternal brother Renoir, retained as a Junior Herdsire http://mystiquemeadow.tripod.com/herdsires/id9.html as was also another paternal brother, Bolero: http://mystiquemeadow.tripod.com/herdsires/id10.html - are both throwing terrific kids for us & doing what we'd hoped they would, improvement-wise! Be sure to check out Camillo's other paternal siblings, to see the consistent overall quality that Jrufio’s proving to be capable of. We couldn't have asked for nicer mammaries, w/ all of the Jrufio daughters freshening beautifully, so far! One*Oak*Hill Jrumember was 2004 ADGA National 6th Senior Kid & a member of the 2004 ADGA National 5th Place Junior Get of Sire) freshened beautifully this year with the impressive mammary one would expect from these fine genetics. Paternal "uncle" One*Oak*Hill Cycas Jrumble http://www.altrece.com/herdsires.htm , littermate to the aforementioned does, is siring terrific quality kids in the Altrece herd.